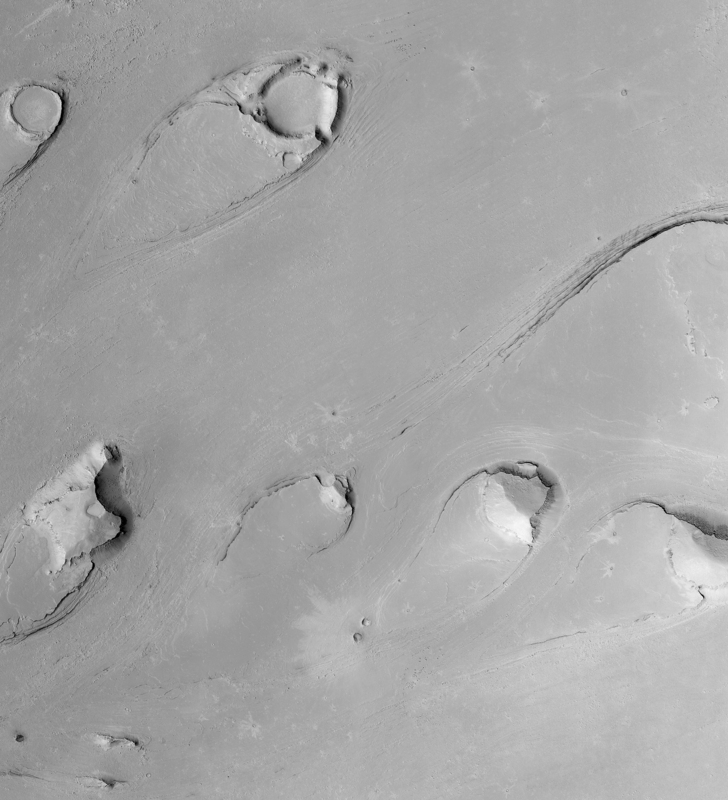 Tremendous floods carved these tear drop-shaped landforms in Athabasca Vallis in the Cerberus region, south of the Elysium volcanoes. The orientation of the streamlined forms indicate that the fluid flowed from the right/upper right toward the left/lower left (from the northeast to the southwest). Similar features occur in central and eastern Washington in the northwestern United States. The examples in Washington formed when massive amounts of water rushed across the landscape, scouring a "channeled scabland" during the last Ice Age, roughly 12,000-13,000 years ago. The features on Mars are much older; while the absolute age cannot be determined, the small impact craters with rayed ejecta patterns on the flood surfaces indicate it must be much, much older than the flood landscape in Washington. This is a mosaic of six Mars Global Surveyor (MGS) Mars Orbiter Camera (MOC) images acquired in 1999 through 2002. Illumination is from the left. The mosaic covers an area 11.9 km (7.4 mi) by 13.0 km (8.1 mi). The full-size mosaic has a resolution of 4 meters (13 ft) per pixel.